I never drink Coke; I rarely drink any kind of soda at all, and I attribute it all to this little episode in my formative years. In Kindergarten we went on a field trip to Arctic Circle. We went behind the counter and watched them make the hamburgers and the fries. We got our pictures taken with their two mascots (whoever they are ... ). We got to look in the big refrigerator where all the food was stored, and at the end, we got to sit in a booth and order lunch. I had never been to Arctic Circle before, but I had been to McDonalds with my family, and it seems like there was only a handful of drink choices back then. 7-Up, root beer and Coke? Anyway, I'd had 7-Up, and I'd had root beer, but I'd never had Coke. I'd never been allowed to have it. I didn't really know why, just that my parents said no, and here was my big chance. My parents were nowhere around, and I could order whatever I wanted! I confidently ordered a Coke. The adult at my table asked if I was sure. Yes, I was sure, and I happily drank the entire thing. 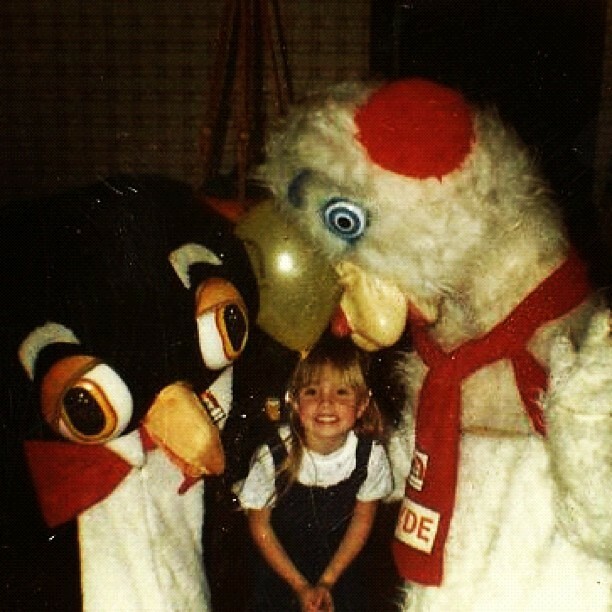 I'm sure I'd forgotten all about it until that night, when my parents asked me if I'd ordered a Coke at Arctic Circle. My Dad sent me to the bathroom to brush my teeth. He said that Coke made teeth rot away and fall out. Then he came in and brushed my teeth. Then I did. Then he did. Then I did. Then he did. And so on. We saved my teeth, and I never drank Coke again.